Updated on Feb. 27, 2019. Wow! It’s been almost a year since we launched our last brainchild, Business VPN by KeepSolid. Well, throughout the year we haven’t been sitting on our hands. All this time our team was improving our productivity and security solutions for business, receiving awards from FinancesOnline, and preparing something new for you. Now it’s high time we presented to you our free VPN Lite and its improved version VPN Turbo. Our company has been on the cyber security market since 2013. Our regular readers could notice that this is our 3rd VPN product after KeepSolid VPN Unlimited and Business VPN. What’s so special about VPN Lite then? What features does our free VPN Lite include? What’s the difference between Free and Turbo version? In this piece, we answer all your whats and whys. Check it out! 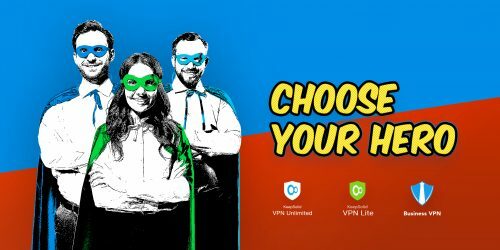 Why should you start using free VPN software by KeepSolid team? One day, our users gave us a simple yet ingenious idea of a one-click software. It was so inspiring that we created VPN Lite literally with a single button. And to top it off, we made it completely free and without any advertising, traffic logging, speed limitations, and even registration. Our team aimed to make this app the most secure, convenient, and user-friendly for you. Moreover, to use our free VPN Lite effectively, you aren’t required to have any technical skills. This app is the perfect solution for people who are always on the go and want to keep their sensitive data safe anywhere. Our free VPN Lite is available for Android and iOS devices. What’s the difference from VPN Turbo? In case the functionality of free VPN Lite is not enough for your needs, you can get its paid version VPN Turbo. It unlocks the whole potential of safe browsing while remaining easy-to-use, tap-and-go solution. VPN Turbo offers our users monthly and yearly subscriptions. Also, there is a 7-day free trial and refund guarantee, so you won’t have to worry about your money.